A lot of backpackers choose to work in farms during their gap year in New Zealand. Although this is not by a long shot, the only option, it is worth taking the time to look into this type of work in depth. What do you get out of Farmwork? For once, you will be paid. Aside from WWOOFing, most farm will be paying wages, it can be a fixed salary by the week, the hour or a commission that will be based on your productivity. Many farms will also offer accommodation to their worker. Some are more than decent and some are a bit dated, it is kind of a gamble every time. You will also enjoy a lifestyle out of the city. Nowadays we spend so much time indoor that working outdoor becomes luxury. Finally, you will be making friends for life. Through hard labor, camaraderie grows and you will bond with coworkers from all side of the world around a well deserved homemade meal at the end of the day. 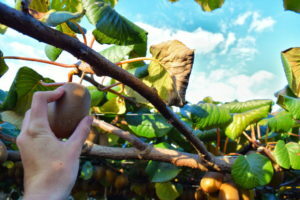 What are the picking seasons in New Zealand? We have made the chart below to help you understand when the busiest seasons are in each areas of New Zealand. As a main rule, the peak months would be November to June but there is usually work all around the year, especially in dairy farms. Jobs are available for any type of backpacker, skilled and unskilled, you will just need to be reliable and fit as some jobs are quite physically demanding.